IMATU, together with many South Africans, has taken a pledge to oppose the abuse of women and children. While we support the international 16 Days of Activism for No Violence Against Women and Children Campaign, taking place from 25 November – 10 December, we believe that this promise must be upheld and actioned all year round. Our members are continually encouraged to report abuse, support survivors and volunteer where possible. 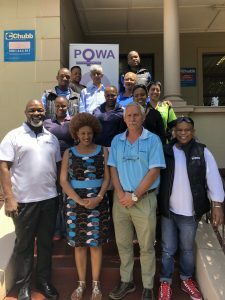 This year, as part of our organisation’s commitment to stop abuse and gender-based violence, IMATU has made a donation to People Opposing Women Abuse (POWA). A non-profit organisation based in Berea, Johannesburg. POWA established the first shelter in 1981, the first of its kind that accommodated women and their children. The main objective of the shelter is to provide a safe, therapeutic environment, were abused women can begin to deal with their situations and receive the necessary support. 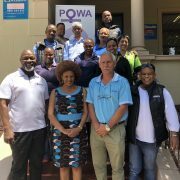 Presently POWA has two shelters situated in the East and West Rand and a 2nd Stage House. Survivors are accommodated for up to a year. This organisation provides professional services that comprise of advocacy, training, psycho-social support, legal and sheltering to survivors of violence. POWA is committed to enhancing the quality of life of all women and girls and has expanded its capacity building efforts to assisting emerging organisations in Limpopo, Northern Cape, North West and Mpumalanga provinces, which in turn leads to better access for women from rural and under-resourced areas. Our members are encouraged to wear white ribbons in support of 16 Days of Activism (25 November-10 December 2018), create an environment at work that enables victims to report abuse, increase awareness, engage around the difficult topic of gender violence and celebrate survivors. IMATU is proud to support this initiative and encourage our members to continue taking a stand against all forms of violence and abuse.